Spiller feat. Sophie Ellis Bextor, Bob Marley, Modjo, Chicane feat. Bryan Adams, U2 and more. 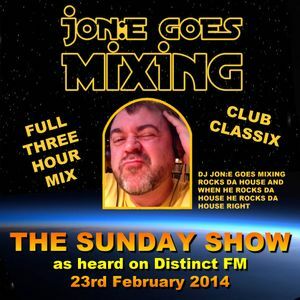 JGM361: The Sunday Show (Distinct FM 23rd Feb 2014) All the classics from the late 90s and early 2000s. This is a major 3 hour mix as heard on Distinct FM on the 23rd Feb 2014. A look back at the best in Jon:e Goes Mixing club classics from yesteryear. Rise and shine with me DJ Jon:e Goes Mixing for another Sunday morning show playing you a big selection of dance and club music to get your Sunday off to a great start! Tune in to Distinct FM 99.7 across the midlands, also on line at www.distinctfm.com and via the android app and tuneinradio app.